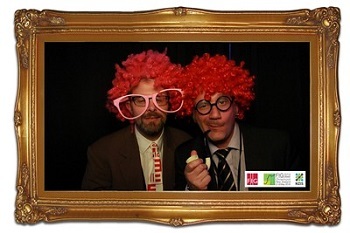 We are now - not recovering from disaster - but from a large and different Working Week success! 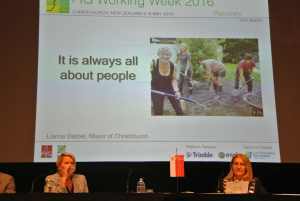 The theme of this years FIG Working Week met the eye from the very beginning. Already at the arrival in Christchurch, New Zealand, the damages caused by the severe earthquakes that took place in 2011-12 in the Canterbury region followed by liquefaction that also did a lot of damage, were visible. The city was full of parking lots filled with rubble clearly showing the many empty spots where houses have been before the earthquakes. 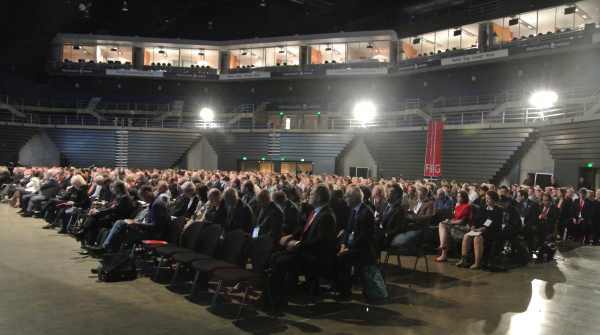 The Sports Arena included a Rugby Stadium – and there was a possibility to buy tickets for a rugby game with the local heroes, The Crusaders, after the Working Week; a Horse Racing Course, which building was used for the technical sessions; and finally a large multi arena that was used for both the plenary sessions and the exhibition. Here lunches and tea/coffee was also served. The Addington Raceway Building included the exotic session room names Blossom Lady, Terror of Love, Christian Cullen and Silk named after famous race horses. 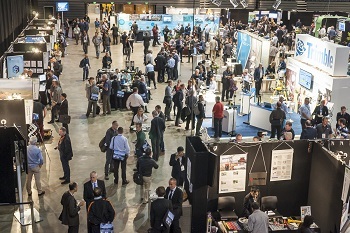 More than 800 participants had found their way to the Working Week in Christchurch from 73 countries, and around 250 papers were presented in 86 sessions during the three conference days. Of these 86 sessions 23 were special sessions, hereunder sessions in cooperation with the institutional partners FAO, UN-Habitat-GLTN and the World Bank and sessions with specific themes. 28 peer review papers had passed the thorough peer review process out of originally 86 submitted papers. A very big thanks to the faithful FIG reviewers and the main editor Volker Schwieger. Hereto a number of pre-workshops were held: on the Small Island development(SIDS) in cooperation with UN-Habitat/GLTN, NZ-Aid and FAO, Reference Frame in Praxis organised by FIG Commission 5 in cooperation with UNOOSA, Young Surveyors conference, STDM training course, and a symposium on History of Surveying. The Young Surveyors had organised a Charity Run/Walk at Hagley Park having around 80 young – and older – surveyors run/walk a 2.5 or 5 km distance. This was a big success, especially for those who had been inside in meetings and workshops all day, and a very different event. The Charity Run was supported by Trimble and Ripro Corporation from Japan and supported MapAction and FIG Foundation. 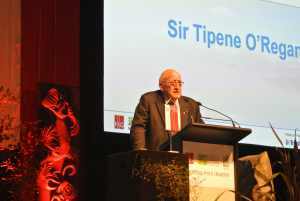 At the Opening Ceremony all participants were greeted festively in the traditional Maori way, followed by an address by Sir Tipene O’Regan, who has been commemorated as one of the Twelve Local Heroes of Christchurch. 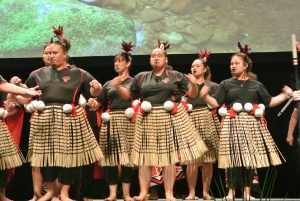 He spoke over the importance of “Identity, names and places” and explained why it is important for Maoris to identify where a person is from. The key note speaker of the Working Week was Margareta Wahlstrom who has been the UN Special Representative of the Secretary General for Disaster Risk Reduction until the end of 2015. Margareta Wahlstrom underlined that disaster is a social issue as well as of economic – what are the immediate costs, but also what are the costs in 5-10 years. There is a special focus right after a disaster, but a focus on the longer run is also important. She furthermore challenged the surveyors stating that “we need people to reach out to decisions makers on the work on disasters” and “disasters are a political issue”. Hereto she encouraged surveyors to be more visible, and to promote themselves and the work that surveyors do much more than is the case today. 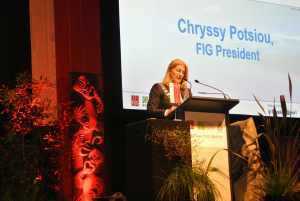 She followed up on the welcome address of FIG President Chryssy Potsiou, and encouraged surveyors to be visible within the areas land use planning and urban planning. “No other than surveyors know about this. We must be more precise – globally, but especially locally and nationally”. Collecting data and systemising it takes a long time but is important. She finally said that today, risk assessment is not counted into many strategies of companies in the private sector, nor is risk perception. The Sendai framework has managed to define disasters in a modern and updated version, and is focusing on not only what is good for us but what we should do at a national, regional and global level. “Build back better – from the start” is a key word – and surveyors play a great role in this. 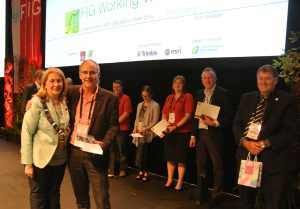 Mark Allen, President of New Zealand Institute of Surveyors, NZIS, the local host and FIG President Chryssy Potsiou welcomed all participants to this Working Week in New Zealand. In her opening address, President Potsiou stated that “FIG will move toward more holistic, multi-sector partnerships to more systematically address the global challenges, including dealing with disasters and achieving secure land rights for all by 2030. FIG has developed a close relationship with United Nations Agencies, the World Bank, the European Union and other important international institutions. It is important that FIG build on these relationships. It is important for FIG to lend its collective expertise to all aspects of disaster management for the betterment of societies everywhere. It is also important that FIG be directly involved in these activities for the growth and vitality of its members and their activities in this era of Globalization. FIG strongly believes in the power of joint research with the UN and the World Bank, in advising people and partners on making smart, evidence-based solutions that shape the development agenda. 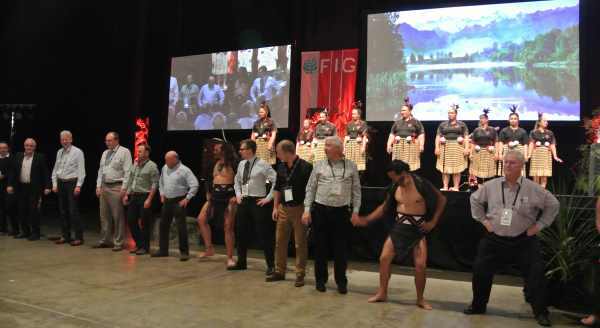 FIG, its member associations, academic members, affiliate members, corporate members, its commissions, task forces and networks, will coordinate more of what we do so that we are more strategic in our collective actions and ensure that priority goes to activities with the highest returns. We will also do more to build on new technologies; create new opportunities for surveyors; and capitalize on more affordable high-resolution spatial data”. 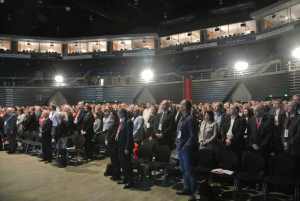 The plenary sessions covered disasters from various angles, and disasters were also a theme at many of the technical sessions including all the areas of surveying. 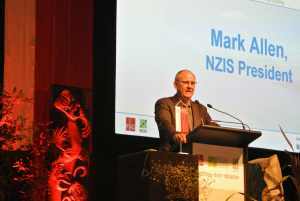 The first plenary session was dedicated the “Christchurch Story” which was told by the Mayor of Christchurch, Hon. Lianne Dalziel, the Associate Minister supporting Greater Christchurch Regeneration, Hon Nicky Wagner and Mr. Duncan Gibb Founding General Manager of SCIRT (Stronger Christchurch Infrastructure Rebuild Team). The “Christchurch Story” was followed by some very strong and impressive photos from immediately after the earthquakes and the rebuilding process on the longer run. These photos more or less talked for themselves. The presenters pointed out that a large amount was paid out in the first week after the earthquakes in order to keep people alive, and that “we should have been better prepared if we had learned from the earlier experience”. One vital focus was to get business up and running as fast as possible so that a “normal” life could be somehow maintained, and to show the inhabitants of the area that “we are here to help you”; e.g. establishing free legal advise. It was furthermore stated that “it is all about people” pointing out that you cannot communicate too much in such a crisis situation and finally that “hope is not a method”. The first speaker in the second plenary session Dr. Hiroshi Murakami almost did not make it to the Working Week because Japan was hit by earthquakes just three weeks before the Working Week and his help was needed. Luckily he still managed to come, and could give the participants another real-life insight in a disaster area. He pointed out that improvements are needed to prepare for future catastrophes, hereunder to have updated maps of areas that can help to compare the situation before and after a disaster. Gregory Scott, leader of the secretariat for the United Nations Committee of Experts on Global Geospatial Information Management (UN-GGIM), presented the global perspective with impressive statistics on disaster loss – both in terms of numbers of affected people (more than 1.5 billion) and in money (more than one trillion dollars). The Post-2015 Development Agenda is actionable, and data about people and place is an indispensable element in this agenda. Keith Bell, World Bank, stated that 80% loss of people in connection with disasters come from low income countries. The complexity for these countries is much larger than in the developed world. The best situation is of course to prepare for disasters, but after a disaster the key term is “Build Back Better” – and one of the first examples of this took place in Indonesia. The “Build Back Better” concept should be used to rethink an area and not “just” build up what was there before. It is important is to have reliable geospatial data – and the World Bank recommends to get this on a Fit-for-Purpose basis that secures that there will be data although it may not be fully detailed. Finally, Keith Bell has already previously asked whether FIG can lead national professional bodies to put surveyors on the pro bono humanitarian map, and in his plenary speech he again took the opportunity to encourage FIG. The network of the Young Surveyors is a good example of how this can be started. Analysis, monitoring, evaluation, warning and support for recovery planning. Sub metre accurate data across the entire country. Rapid data processing and disaster information extraction to enable disaster evaluation and early warning to the people in potentially affected areas. Online video conferencing throughout China. Accurate mapping for post-disaster reconstruction planning helping with the rapid rebuilding of devastated cities. He challenged the audience to: Be quick, Be accurate, Be effective. The ten FIG Commissions, Young Surveyors, FIG Networks, Permanent insititutions and Task Forces have been heavily involved in the planning of the technical sessions that covered a broad range of themes within surveying, and many with the overall theme “Recovery from Disaster” in mind. The technical sessions were a mixture of presentations and in-depth discussions. There were special sessions on the Voluntary Guidelines organised together with FAO, a special session on Nepal organised jointly by FIG Young Surveyors and UN-Habitat/GTLN on Nepal Building Back Better in order to introduce challenges of building back better initiatives in the post-earthquake situation in Nepal including rehabilitating informal/non-formal settlers and risk hazard-prone settlements, to present current efforts of building back better Nepal and to explore the way forward based on international best practices.Special sessions in cooperation with UN-Habitat/GLTN, a special session elaborating on the pre-conference workshop on SIDS in which a declaration was finalised, and a high level special session on the Fit-for-Purpose approach launching a Fit-for-Purpose guide and many more. See the proceedings for the full list of sessions, papers and presentations. Again in 2016, the FIG Platinum Corporate Members, Bentley, Esri, Leica and Trimble were offered a session in the technical programme, and they had all invested in a thorough planning of the sessions which were all well visited. The Local Organisers had made a great effort to organise some very popular and informative technical tours e.g. 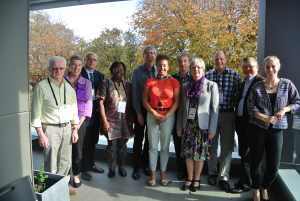 showing the hands-on rebuild situation in Christchurch, a visit to Land Information New Zealand, the University of Canterbury, an earthquake-trip to Port Hills. The Port Hills rock falls resulted in one of the largest rock fall studies in the world. To determine the ongoing extent of land movement multiple continually operating CGPS stations and crack monitoring points were installed. Monitoring moved quickly from a basic string line between 2 points, to state-of-the-art survey. A well designed exhibition area met the participants at the tea breaks and during lunches. The two platinum sponsors Esri and Trimble were occupying the centre of the large multi arena. The Diamond Partner LINZ together with the other exhibitors filled out the exhibition space which was very crowded during the breaks. Wednesday afternoon the exhibition opened for the public. Many talks with exhibitors continued after the breaks and many took the opportunity to clear their head in the exhibition area during a session. No Working Week without the possibility to network which is also an important part of the event. The Welcome Reception took place at the Transitional Cathedral, a new built cathedral building. The Transitional Cathedral was built after the original Christchurch Cathedral was badly damaged in the earthquake. The rest of the old cathedral is still standing showing what large damages happened to many buildings. The room was packed, the talk was loud and both reunions took place and new acquaintances were formed. 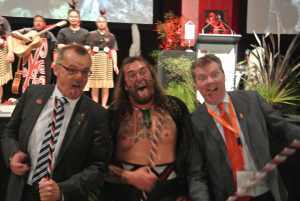 The Kiwi Evening which is also a dinner in support of FIG Foundation and supported by Trimble included a traditional Maori performance. At this performance especially the male participants had the possibility to find their inner male soul by shouting out loudly and practise their dancing skills. 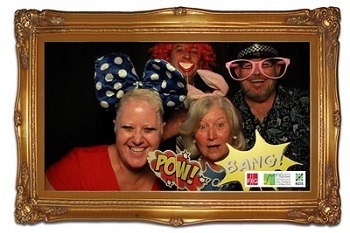 The relaxed atmosphere – apart from the shouting – gave a good opportunity to mingle and meet. 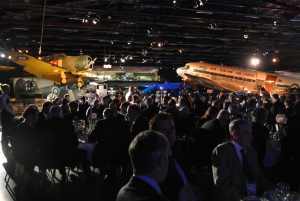 The Gala Dinner was held at the Air Force Museum of New Zealand. 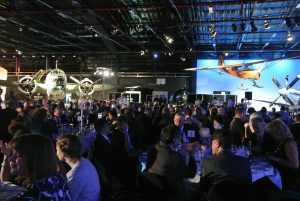 The exhibition area was open and the dinner was held in the hangar and the dinner tables were surrounded by all the airplanes. It was a very special experience to sit among the old air planes enjoying a wonderful dinner. A trio entertained with an enormous repertoire, and the dance floor was filled up to the very end. 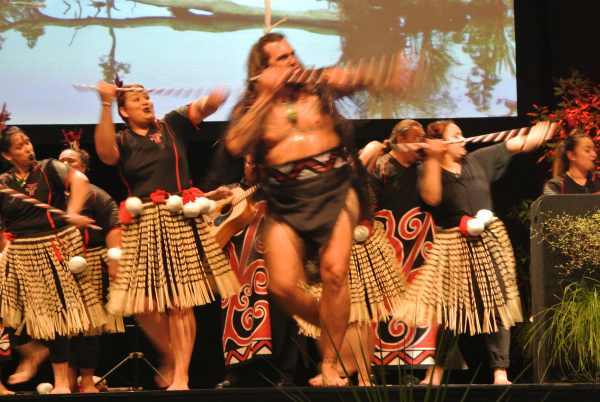 For the foreign participants it was also possible to register for a home-hosting evening, where the hospitable New Zealanders opened their homes for a nice and intimate dinner. This turned out to be a fun evening for both the local and international participants. The commission dinners were traditionally held on the second conference day. Right before the dinner the commission meetings were scheduled, so that it would be possible to go directly from the more serious meeting to a nice get-together dinner in relaxed surroundings. Some commissions joint forces and invited to a joint dinner whereas other commissions organised their own dinners.